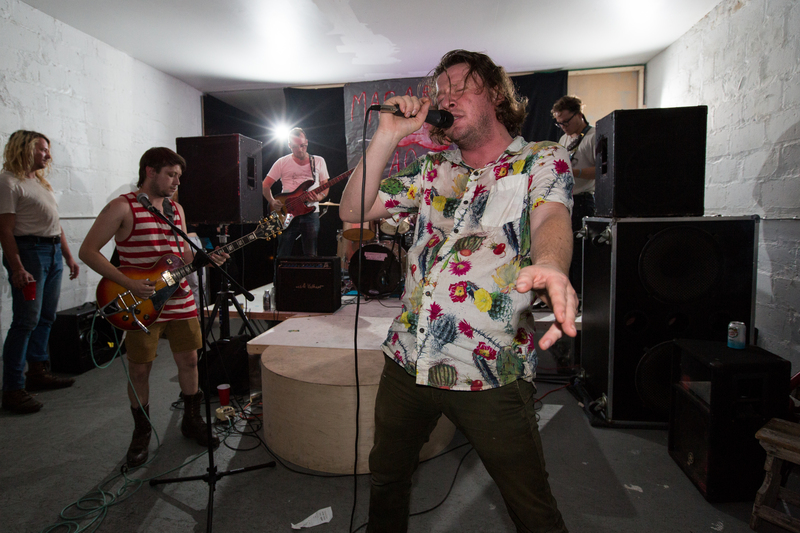 The recent police raids of Bushwick venues Palisades and The Gateway, resulting in the former’s temporary closure, served as reminders of the tenuous nature of the DIY community’s most beloved venues. The news of one space’s closing is often accompanied by another’s opening. While the turnover can feel discouraging, it is not unusual to find the scene’s most familiar faces reappearing behind new projects and spaces. These local stalwarts provide whatever fleeting degree of continuity is possible in Brooklyn’s DIY performance and arts community. Enter The Glove, a new multidisciplinary space in Bushwick – equal parts performance venue, art gallery and rehearsal space – opened by the 8-member artist/curator collective behind Bohemian Grove, another now defunct local house venue. The group boasts experience from DIY venues across the country, from Kansas City to Pittsburgh to Atlanta, not to mention years in Brooklyn, and they are focused on preserving the open, participatory ethos of those communities. “The idea is not to have one controlling idea, but to have a space that can protect and support several different kinds of ideas,” says co-founder Cameron Stuart. The space, a 1500 sq. ft. warehouse, will serve a handful of purposes across multiple rooms. The plan was to host a soft opening on June 8th, with a grand opening on July 1st. However, following the closing of Palisades the group agreed to take on a number of the venue’s outstanding bills. They have now hosted nine shows before what was supposed to be their official opening night, garnering a surprise mention in the New Yorker along the way. Owners and managers from Aviv, Shea Stadium and Palisades all made appearances during the first week of shows, a display of community solidarity that resonated with The Glove’s founders. The Glove has taken the impromptu activity in stride, building out the venue as they go and pouring the funds from the unexpected bills directly back into the space. “It’s been a good way to gauge how to use the space, how to build it out, just seeing it with people inside,” says Lily Chambers. There is more work to be done, and as things come together they plan to place an emphasis on curating more coherent events and bills. The group is quick to emphasize that their goal was not just to open another music venue. The Glove will serve as an art gallery, hosting both daytime and nighttime events over a range of mediums, from music to performance art and beyond: “we’ll have plays, stuff that doesn’t necessarily have an easy home in Bushwick,” says Stuart. Off the main room, an alcove houses an artist studio for rent, an addition that Chambers mentions will help to maintain valuable creative energy throughout the day. The opening of The Glove marks a graduation of sorts for those behind it. While the mission hasn’t changed – “There’s one vision: it’s many visions,” says Matt Maichel – the venue, scope and ambition have. The unexpected closure of Bohemian Grove earlier this year highlighted the group’s need to find a more permanent, legitimate home. “We just have more resources, now,” says Stuart. The upgrade from a house-venue, Chambers adds, “is about being able to expand our platform with a larger space. We can get bigger projects [here] and raise smaller projects up to a higher level.” Grove faithful need not fear – plans exist to continue hosting landmark Bohemian Grove events like Weirdwick and Toiletpalooza. The group is familiar with the fragility of the DIY venue format, but is above all committed to maintaining an open platform for the local community. As grassroots venues continue to struggle against rising rents and myriad bureaucratic hurdles, they are hyperaware that protecting the city’s underground creative culture is more important than ever. “It’s a space for freaks,” Stewart says in summary. The setting may be a little more professional, but the people running it have not changed. Check out The Glove on Facebook and Instagram for more information on upcoming events.